On a Friday afternoon, I arrived at Dacor’s kitchen showroom to help prep the kitchen, greet our guests and ensure drinks flowed. 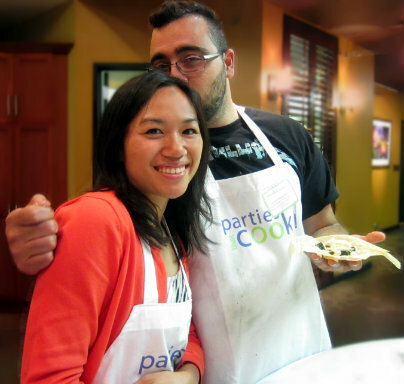 It was the first Date Night cooking class of the new year, I was new to the Parties That Cook team, and this was my first experience with their hands-on cooking events. 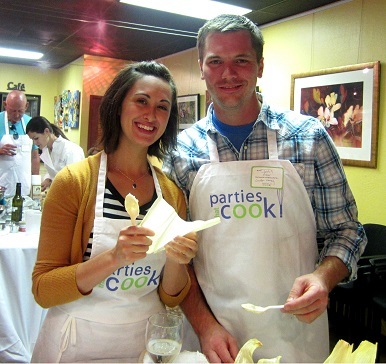 Date Night with Parties That Cook is a couples cooking class, but from what I saw, it could be better than couples therapy. Guests began trickling in a few minutes before 6 pm, many coming directly from work, all hungry and eager to start cooking. 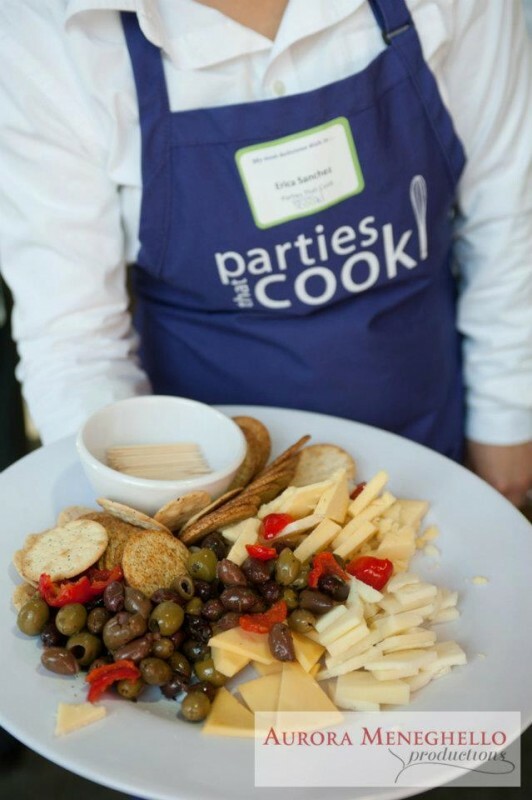 The attendees checked in, “suited up” in Parties That Cook aprons and mingled with other attendees chefs-in-training. The lead chef (Executive Chef, Tanya) gathered the group in the kitchen for an introduction and cooking demonstration. Tanya shared tips and tricks of the trade with a captivated audience. As they listened intently to the instructions, guests stood with arms draped over their partners’ shoulders. The couples seemed excited to be there, ready to cook together, meet new people, and have fun…except for one. 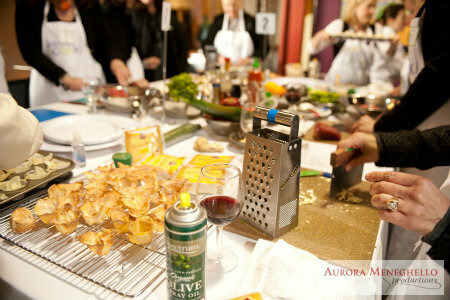 After the demo, the group broke into teams to begin working on the evening’s small plates recipes. Chefs circled the floor happy to help if and when questions arose. 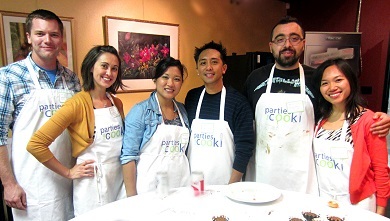 Most attendees were fairly new to cooking and delighted by the process. Still, I couldn’t help but focus on the averse couple. To my surprise, they had begun to warm up. We really mean it when we say you’ll “heat up the kitchen” at Date Night. As the night progressed, wine was flowing, new friends were made and delicious dishes were coming together. I found the originally hesitant couple smiling and even laughing together. Date Night with Parties That Cook must have been just what the doctor ordered! They ended up having a wonderful time, and even bid us farewell with huge thanks, full bellies and smiles on their faces. Several couples exchanged phone numbers and think a few may have even gone out for drinks following the class. An excellent evening, indeed. Working the event was fun; almost as entertaining as participating as a guest! This, I found out two weeks later when I took the class with my spouse. Stay tuned for a second Date Night blog, written from the perspective of an attendee (me! ).